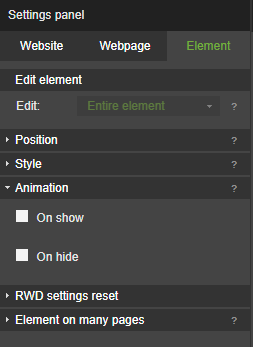 In website builder WebWave you can set animations to elements on your website like text, image, button etc. In this article, you will learn how to build a website with elements animations. In order to add animation to an element, select it and go to the Settings panel. Enter "Animation" and choose between on show/on hide. Now you can freely adjust animation to your needs. In "Animation type" you can select one out of five element animations. Choose between fly in, fade in, expand in, fold in, reveal. Keep in mind that each of them has different further parameters to edit. In the next step select animation direction. It is only available for animation type: fly in, fold in reveal. Select duration time of an animation and delay time. 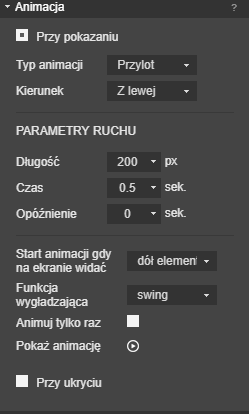 In this step, you can set when will animation start. Select from three options: start animation when the screen contains elements top, elements bottom or px number of the element. Animation easing allows you to set a frequency of animation lines - a speed of element being displayed in time. Select one of eight options. By selecting animate only once, you can prevent animation to be activated when a user scrolls website again. Check how the animation looks like before publishing your website.